Always remember, two thin coats to keep the Doctor away! Apply your base coat in the same way as you would with any colour. Remember though that when thinning down the metallic paint the metallic flecks will settle to the bottom so mix regularly before you apply. I tend to apply the first coat in one direction and then the second coat in a perpendicular direction and this tends to help ensure a smooth coverage. Layering is for the cool kids! The next stage is to overbrush with a strong highlight, one of the difficult things when painting something intrinsically shiny is getting a smooth transit in the highlight, overbrushing will ensure you get a smooth transition and will also pick out the edge details that will catch the light. Jimmi covered overbrushing a little while ago and its a great technique, try to avoid the classical dry brush for metals as when removing the paint from the brush before hand you will likely also remove the metallic flake leaving just base colour of the metallic paint. Metals have a real depth of colour when you look at them which can be hard to replicate. This can be achieved by using glazes. You’ll hear me harp on about glazes a lot but they are a great arrow in your painting quiver. For the corroded steel I used a light glaze of Waywatcher Green which also helps tie the base colour and the highlight together. For a clean steal you could use a light blue glaze and for gold try purple and deep reds. Next a shade of Nuln Oil to enhance the shadows and details which may get washed out by the previous glaze. I use the Citadel gloss washes on metals as they flow really well into the cracks and the gloss colour helps bring the shine of the metal back. Next I reapply some of the sharp silver highlights and stipple a few scratches onto the surface. Finally I work on adding rust. Now here I use Modelmates Rust Effect, unfortunately this company appears to have closed but there are alternatives out there such as using Citadel’s Typhus Corrosion combined with Ryza Rust, something again we’ll explore in the future. Now again the easiest way to look at how to paint rust is to look at your surroundings. Now you can see here that the deepest colour occurs at the top then some of the lighter pigment washes down with rain etc. There are two methods here. First whenever your painting you will likely notice that the colour concentrates at the end of your brush stroke. So start at the limit of the area you’re painting and finish where you want the rust to start. Effectively moving the paint to the area of interest. Next when you apply your second layer, first put some thinner onto the model then when you put the rust colour down it will drip into this area naturally, use a clean fine brush to then drag fine tracks of rust colour down. You may need to do this a few times to get a good concentrated streak. Finally one of the most important things is where to place to rust on the model. It should be somewhere that you would expect rust, our brains are designed for pattern recognition, so if the rust is placed somewhere obscure it will be flagged up in your mind and the model will never look quite right. Again look for rusted parts in your surroundings to see where best to place it, as a rule of thumb anywhere on the model that will come in contact with damage such as around rivets and bolts, or protruding sections is a good place to start. 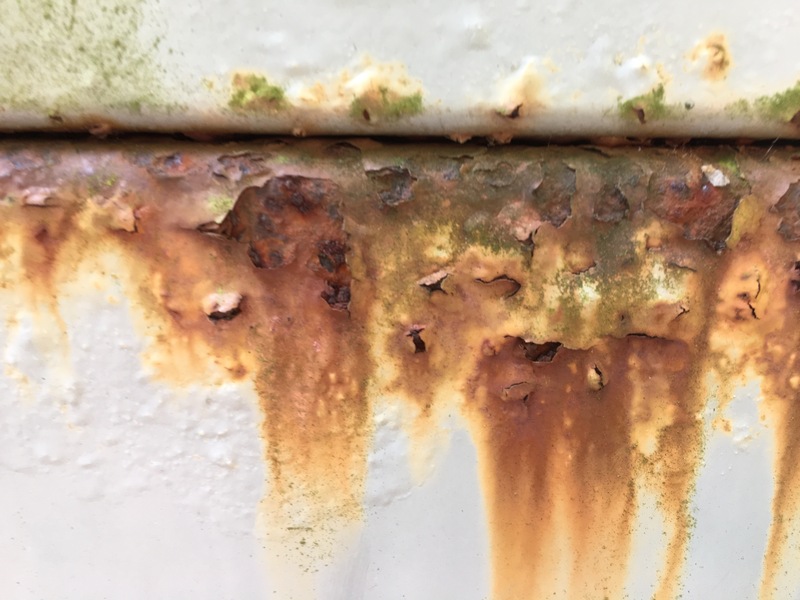 So there you have a quick rundown of ways to paint corroded metal. Its a great way to make you minis look more aged and natural and also helps break up large areas of metal you get on some minis. Thanks so much for reading and lets us know what you think below or if there’s anything you’d like to see int he future. If you want to see what this model looks like when he was finished, check out my homebrew rules for him! This entry was posted in How To, Painting Tutorial, Rand Al Thor and tagged Painting Metal, Painting Rust Effects, Spider Cultist by Randalthor2611. Bookmark the permalink.